This 36 inch square feather light micro fleece blanket has rounded corners. The edges are paired with cotton Spanish lace or blue or pink spaghetti cord trim. View the edges on the graphics page. 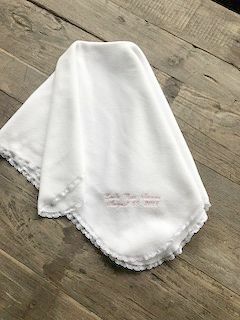 The baby’s full name and date of birth are embroidered on the inside corner. Each blanket is wrapped in tulle and white satin ribbon.